Cemetery research used to require a visit to the cemeteries where your ancestor's were laid to rest. Walking around the graveyard looking at the headstones. Now, there are some pretty extensive web resources available for tracking them down without ever leaving your home. A visit to their grave may still be in order, but at least you can do your research online. The practice of marking the final resting place of a loved one dates back thousands of years. Inscriptions on tombstones provide an archeology of human history. Many people think spending time in cemeteries is creepy, but for genealogists, these places are rich sources of valuable information about their ancestors. They vary greatly in content. They can not to be considered a primary source. Obviously, the person buried below did not order the monument or provide the information inscribed on it. Errors can be introduced at every step from the person providing the information, transcription errors and errors made by the stone carver. Many markers have deteriorated to the point that they can no longer be read. They can, however, be used to corroborate birth and death dates in situations where birth and death certificates either don’t exist or can’t be found. They are an excellent source of dates, birthplaces, maiden names, spouses' names and parents' names. They can also provide evidence of military service, membership in a fraternal organization and religious affiliations making them useful to genealogists. The most straightforward way to collect this information is to visit the graveyard where an ancestor is buried, so the marker can be inspected in person. Another reason to visit in person is that other relatives might be buried nearby and you never know what discoveries you will make. Often times, the cemetery is located in another state or country and an in person visit is not possible. In lieu of a physical visit, there are a couple of really good websites to help you make a virtual visit using the Internet. 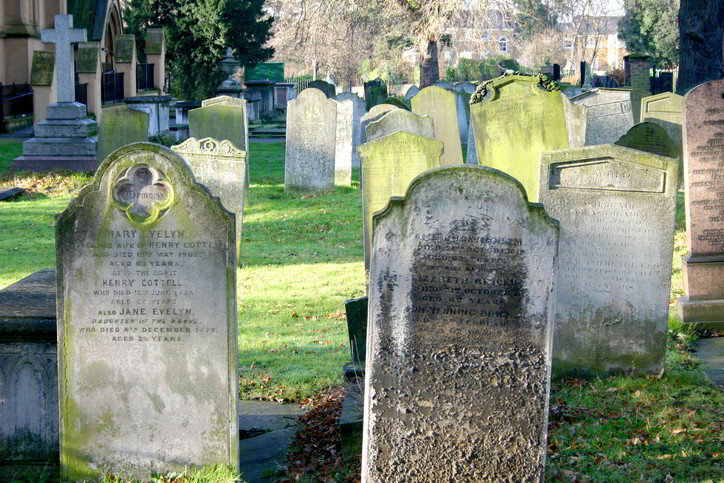 Two of the best websites are findagrave.com and billiongraves.com. Both of these sites allow gravesite visitors to upload digital pictures of headstones. If you are lucky, someone before you might have uploaded a picture of the grave you are interested in. There is a pretty good chance that one of these sites at least has an index listing of the grave site you are looking for. Just understand that tombstone inscriptions are sometimes incorrect and should only be used as corroborating evidence. Make sure you consult these web resources before planning a cemetery visit, so you can make sure your ancestor is in fact buried there and possibly get a description of their grave's location.